Sabari rail line is a proposed 111 kilometres (69 mi) railway line from Angamaly to Erumeli, near Sabarimala that has been sanctioned in the year 1998 by Indian Railways. According to a Memorandum of Understanding (MoU) signed between the Kerala State and the Ministry of Railways on January 27, 2016, commercially viable railway projects will be identified and handed over to the Special Purpose Vehicle (SPV) to be fast-tracked on a 51:49 per cent equity basis. SPV has discussed about the extension to Punalur. The current Sabari Rail line is under PMO - Pro active governs and timely implementation (Pragati); will be monitored by the Prime Minister's Office. Another proposal for this railway line is extend to Thiruvananthapuram. If this proposed Sabari railway line is connected to proposed new railway terminal at Nemom near Thiruvananthapuram via Nedumangad, several long distance trains are supposed to be operated from Nemom via Punalur and Angamaly to Chennai/Bangalore and rest of country. Survey for new lines from Madurai Junction to Kottayam and Dindigul Junction to Cumbum lower camp, Kumily to Sabarimala, ettumanoor to pala also started. Angamaly for Kalady is a railway station in Ernakulam District of Kerala State in India operated by Southern Railway Network. It lies in the Shoranur-Cochin Harbour section of Trivandrum division. Angamaly is the halting point for 46 trains including express and all passenger trains passing through this station. The railway station is located about 26 km from Ernakulam Town and 10 km from Aluva stations. Kerala's government started the land acquisition for the construction of this Sabari railway line project and established special Thahasildhar offices at Perumbavoor and Palai in 2006 and at Muvattupuzha in 2010 for the land acquisition of Sabari railway line. Railway and revenue department has conducted joint survey for the land acquisition of this railway line, laid boundary stone for the acquired land and notification for land acquisition up to proposed Ramapuram railway station in Kottayam district. 90% of railway line construction up to Kaladi railway station 7 kilometres (4.3 mi) was completed by 2010. Kerala is a state on the southwestern, Malabar Coast of India. It was formed on 1 November 1956, following passage of the States Reorganisation Act, by combining Malayalam-speaking regions. Spread over 38,863 km2 (15,005 sq mi), Kerala is the twenty second largest Indian state by area. It is bordered by Karnataka to the north and northeast, Tamil Nadu to the east and south, and the Lakshadweep Sea and Arabian Sea to the west. With 33,387,677 inhabitants as per the 2011 Census, Kerala is the thirteenth-largest Indian state by population. It is divided into 14 districts with the capital being Thiruvananthapuram. Malayalam is the most widely spoken language and is also the official language of the state. Perumbavoor is a Historic Place located at Bank of Periyar(Poorna River) in Ernakulam District in the Indian state of Kerala. It lies in the North Eastern tip of the Greater Cochin area and is also the headquarters of Kunnathunad Taluk. Perumbavoor is famed in the state for wood industries and small-scale industries. Ernakulam lies 33 km southwest of Perumbavoor. The town lies between Angamaly and Muvattupuzha on the Main Central Road (MC), which connects Thiruvananthapuram to Angamaly through the old Travancore part of Kerala. Perumbavoor lies in the banks of rivers Periyar and Muvattupuzha. Muvattupuzha is a prominent old town in the midlands directly to the east of Kochi. It is situated at around 40 km (25 mi) from downtown Kochi. The town is a growing urban centre in central Kerala and also an aspiring new district headquarter. The town is also popular as the starting point of Muvattupuzha river which happens by the merging of three rivers – namely Thodupuzhayar, Kaliyar and Kothayar – to form Muvattupuzhayaar. Thus, this Thriveni Sangamam or confluence of three rivers is called Muvattupuzha. The revenue department of the Government of Kerala completed all formalities of land acquisition in Chelamattom village, Perumbavoor village, Koovapady village, Vengoor West village, Rayamangalam village, Asmannor village (on 19 August 2008) and Muvattupuzha village (on 28 October 2011) and declared the land value of acquired land for this railway line. But land price distribution to the land owners of these villages has not happened due to the lack of funding from the Railway Ministry of the Government of India. Although the Railway board has approved the revised estimate of Angamali- Perumbavoor reach of this railway line ₹203 crore (US$31 million), has not given any fund for the completion of revised estimate approved reach. The Railway board has written to the Kerala government that without 50% of cost sharing by the state government, they could not allocate any further funding to Sabari railway project.The Railways have started the pre-non interlocking works in the Angamali Railway station on August 3, 2017 which aims at connecting the Sabari rail line to the main line of Ernakulam-Shoranur.They also have decided to open the railway offices at Perumbavoor and Muvattupuzha for the fast acquisition of lands. Idukki, one of the districts in Kerala which has no railway station, will get railway connectivity and two railway stations through the line. The railway line will help the wood–based and rice–based industries concentrated in the Perumbavoor–Kalady area, and the tourist destinations of Ernakulam, Idukki and Kottayam districts. Ernakulam refers to the central, mainland portion of the city of Kochi in central Kerala, India and has lent its name to the Ernakulam district. 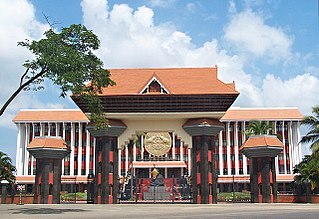 The Kerala High Court, the office of the Kochi Municipal Corporation and the Cochin Stock Exchange are situated here. The Ernakulam Junction is a major railway station of the Indian Railways. Initially, Ernakulam was the headquarters of the Ernakulam District but was later shifted to Kakkanad. Ernakulam was once the capital of the Kingdom of Cochin. It is located 220 kilometres (137 mi) north-west of the state capital Thiruvananthapuram. The city has served as an incubator for many Malayali entrepreneurs and is a major financial and commercial hub of Kerala. Odakkali, located at 10.09 North and 76.54 Eastis a village in the Ernakulam district of Kerala State, in southern India. Odakkali is 26.8 km away from Aluva in Aluva Munnar Road. Kothamangalam is a municipality in the eastern part of Ernakulam district in the Indian state of Kerala. The town is in the foothills of the Western Ghats mountain ranges. The highway NH-85 Ernakulam – Madurai – Rameswaram passes through Kothamangalam. Vazhakulam lies east of the town of Muvattupuzha in Ernakulam district on the Muvattupuzha - Thodupuzha road in Kerala, India. This town is famously known as Pineapple City due to large-scale cultivation of pineapple. The town is the largest Asian pineapple market. Kerala Agricultural University established a Pineapple Research Station at Vazhakulam in 1995 to give research support to pineapple farmers. The pineapples cultivated in Vazhakulam has been credited with geographic indication. Today Vazhakulam pineapples are marketed as GI tagged products. Vazhakulam is part of Muvattupuzha Taluk Rice used to be the main crop of this area in the 1960s and 1970s, but the advent of rubber cultivation saw many rice fields and estates being turned into rubber plantations. Thodupuzha is the largest town and municipality in Idukki district in the Kerala state of India, spread over an area of 35.43 km2. Thodupuzha is 57 km (35 mi) from Kottayam and 62 km (39 mi) south east of Kochi. Thodupuzha is 200 km from the state capital, Trivandrum. Geographical classification of Thodupuzha Region is Malanad or Idanad. Thodupuzha is also known as "Hollywood of Kerala" as it is used as a filming location for a large number of Malayalam and Tamil movies. Karimkunnam is a village in Idukki district in the Indian state of Kerala. Kanjirappally is a taluk and a town in Kottayam district situated about 38 km (24 mi) away from the district capital, in the state of Kerala, India. National Highway connects Kanjirapally to major nearest cities. Kanjirappally, also known as the Gateway of Highrange since it is the geographic entrance to the 'Malanad' or the Hill country of Kerala, which extends to Idukki district and then to Tamil Nadu. Kanjirapally is one of the most busiest towns in kottayam district. A new airport has been proposed which is near to kanjirapally in Erumeli. Koottickal is a Town at the base of Western Ghats mountain ranges in the Kottayam district, Kerala. It is 2,000 feet (610 m) above sea level and is situated on the eastern border of Kottayam District, 55 km from Kottayam, and around 5 km away from Mundakayam on the NH 220. There are streams and waterfalls in the surrounding places. The Muthukora Hills are nearby. Urban centres in Kottayam and Ernakulam districts can be viewed from the top of Muthukora Hills. Erattupetta is a municipality town located in eastern Kottayam district of the state of Kerala, India. It is 38 km east of Kottayam, the district capital, and its just 13 km east of the city Pala. Erattupetta was known as Erappili and Erappuzha before. The town is a part of the Palai city metro. Ponkunnam is a census town in the eastern high-ranges of Kerala, India, part of Kottayam district under Kanjirappally Taluk. Ponkunnam literally means 'The Town on a Golden Mountain'. Nearby towns are Kanjirappalli, Manimala and Pala. This part of Kerala is famous for its fertile land and rubber plantations. It is at an altitude of 495 feet above mean sea level. The town is at the junction of two major roads in Kerala: NH220 and main Eastern highway. The climate is moderate with timely cold breezes; the town is the gateway to the eastern high ranges.The town is famous for its volleyball traditions and customs. Almost every year there is an ever-rolling volleyball tournament happening in Ponkunnam Mahatma Gandhi Mini stadium. Mallikassery is a small village near Paika, in Elikulam Panchayat of Kanjirappally Taluk in Kottayam district, in the state of Kerala, India. The Main Eastern Highway is the lifeline of the high range townships of the Travancore region of Kerala state, India. It is also known as Punalur-Pathanamthitta-Palai-Thodupuzha-Muvattupuzha Highway. Main Eastern Highway is categorized as State Highway - 08 of Kerala. It is the second longest State Highway of Kerala covering a distance of 153.6 km. The districts it passes through are Kollam, Pathanamthitta, Kottayam, Idukki and Ernakulam. Municipalities are the urban local governments that deal with civic functions and local development functions in the municipal area. The 74th Constitutional amendment provided for a national framework for municipal governance in the country, and Kerala has been following that pattern since 1994. Consequent to this amendment, several changes have occurred in the functions, powers, and responsibilities of the municipalities, and the states had to make necessary amendments to the legislation on the local governments in the respective states. The Kerala Municipalities Act of 1994, enacted as per the constitutional amendment, governs the pattern, functions and services of the municipalities in Kerala. The act, which was integrated for the municipalities and corporations in the state, laid out the constitution of the town panchayats, municipalities and municipal corporations. The state of Kerala has 87 municipalities and six municipal corporations. With 13 municipalities, the district of Ernakulam has the most number of municipalities in the state. Manathoor is a small village in Kottayam district, aside Pala - Thodupuzha Highway, 12 km from Palai town and 15 km from Thodupuzha town. Koruthodu is a village/town in Kanjirappally Taluk, Kottayam District of Kerala state, India. It is situated on the Highway connecting Mundakayam to Sabarimala temple, Kerala, and is at the border of Pathanamthitta, Kottayam and Idukki districts. The nearest town Mundakayam is 13 Kilometers from Koruthodu. The river Azhutha runs through the borders of this village. Nearby locations include Kanamala, Vandanpathal, Mundakkayam and Panakkachira. The State of Kerala consist of 14 districts, 27 Revenue Divisions, and 77 taluks. Each revenue division is headed by a Revenue Divisional Officer and assisted by Senior Superintendent among others. Josegiri is a village in the southeastern side of Ernakulam district in the Indian state of Kerala. The village is bordered by Kottayam district on the south side and Idukki district on the eastern side. Josegiri comes under the Elanji gramapanchayath in Muvattupuzha Taluk. The majority of the population is Roman Catholic Christian. Major source of income is Rubber. Ernakulam district is blessed with all types of transport. It has the most number of Regional Transport Offices in the state. The Ernakulam–Kottayam–Kayamkulam line is a railway line which runs through the districts of Ernakulam, Kottayam, Pathanamthitta and Alappuzha in Kerala state of India. This railway line starts as a branch line from Ernakulam Junction railway station towards Kottayam and joins with the Ernakulam–Kayamkulam coastal line route via Alappuzha at Kayamkulam Junction. This line comes under the Thiruvananthapuram railway division of Southern Railway Zone of Indian Railways. The line has a total distance of 114 km. The Ernakulam - Kottayam section opened in 1956-57 and Kottayam - Kollam section in 1957. ↑ Radhakrishnan, S. Anil (2 December 2015). "State nod to share Sabari rail costs". The Hindu . Thiruvananthapuram . Retrieved 4 February 2016.